Over the years I have experimented with new tools and techniques, some by others, some of my own invention. Several have proven worthless; a few have served their purpose quite well. On this page are listed the tools and modifications I have played with to the satisfaction of my students and myself. It seems only natural, then, to share these with other woodblock printmakers, like you. The prices are reasonable; they do not, however, include handling and shipping. Still, even when these are included, the final cost is within most budgets. If you have questions about any tool, or want to know how best to use it, or want to know why you need to have it, do not hesitate to contact me. If you would like to order some tools, please send the number and name of the tool, how many you want, your name, mailing address, e-mail address from the Contact page. I or my studio manager will reply with methods of paying. The best way to send funds is by International Postal Money Order, WESTERN UNION, or PayPal. Bank transfers are too costly in Japan to be practical and so are discouraged. Writing checks is unknown in Japan. Credit card payments are accepted for Visa, JCB, American Express. These tools are mainly for sale in Japan. The prices stated here are only slightly above our studio costs. However, shipping to foreign countries would nearly double the costs in some cases. Most of these same tools can be ordered from McClain's in Portland, Oregon, USA. Thank you for your questions and your orders. The Kento knife is made of wood and high-quality metal, with a brass knurl; used to cut the registration marks on the blocks; it is 15cm long, 15mm wide, but thinner than the traditional knife. It has a stylish design and because it is thinner, it’s lighter and easier to use. The circle carving knife is an original knife available only from Steiner Print Studio in Japan and McClain’s Art Supplies in Portland, Oregon, USA; invented in 2009 by Mr Steiner, it can carve small circular holes in the blocks without leaving dents in the edges of the cut as the other knives tend to do; wood, brass knurl and metal; 14cm long, (handle: 8cm long; blade: 11cm X 6mm wide). 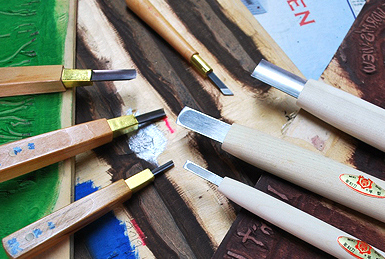 Reasonably priced and useful original knife set for woodblock print making. It is composed of the tools from No. 4 to No. 10 below. All knives are professional level. The widest knife, the 18mm gouge is used for the initial clearing of the block. It is 22cm long, wood and metal. The 9mm gouge, usually the second knife used after the 18mm, is used to clear away any remaining wood around the areas to be printed. Wood, brass and metal: about 14cm long; the handle opens to allow replacing the blade, or extending the blade out after it has been sharpened shorter than you like. The 6mm wide gouge is used for clearing smaller areas. About 14cm long; wood and metal; the handle swings open to allow changing blades or making the blade stick out more from the handle. The 3mm gouge is used for clearing the smallest areas; wood and metal, about 13cm long; same handle as 6mm and 9mm. The basic knife is used for carving only, not any clearing; wood, brass, metal; about 14cm long; blade can be slid out of the handle for replacement or making longer. The 15mm wide aisuki clearing knife, with slightly rounded blade corners, is made of wood and metal; 22cm long; used for bokashi fades, softening cut non-printing areas’ edges, making shallow cuts for texture, and flattening widely cut areas; an important knife for the professional printmaker. The 6mm square knife is 21cm long, wood and metal; used mainly for carving very fine lines and for some clearing; can be used for making fades. 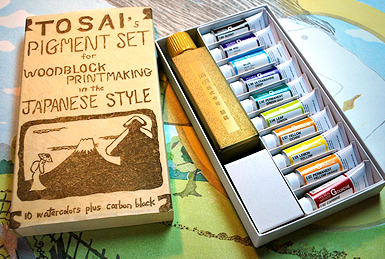 The set has 10 tube colors and one bottle of pure sumi; the tubes are 15ml, the sumi bottle is 100ml; the box cover is an original woodblock print; colors are: carmine, burnt umber, iris, aqua blue, ultramarine deep, permanent green deep, leaf green, lemon yellow, permanent yellow orange, and yellow ochre. Using these colors with water or drops of black, one can make approximately 1,455,376 colors. 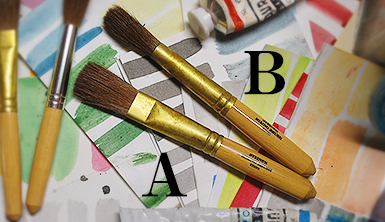 These brushes are patented; used to mix evenly two or more colors together in cupper containers, and then put the color on the block for printing; wood and brass knurl; sheep and horse hair; two designs in two sizes: round brushes for mixing colors only; flat brushes for use with black or sumi only; size #20 is 14cm, long; size #15 is 13cm long for both designs.. The cupper is used to mix and store pigments; totally air tight caps on strong, clear plastic containers; circumference is 10cm, height is 4.5cm; will not weaken with age; orders only for boxes of 10 cuppers. Using the Japanese waterbased printmaking method, the washi paper must be moistened before printing. Many printmakers use ordinary newspaper; others use a cardboard or cloth. Here is the ultimate material for moistening paper, a man-made cloth that can be sparingly but evenly moistened. It will maintain the papers’ optimum degree of moistness for long periods of time, even overnight. Very light weight, easy to cut with textile scissors, the pack will last for years under normal use. Order the sizes you need for each size print you make, or order only a large size to use for all your printing needs. The pack consists of three layers of material. Usually, between the bottom two, the moistened paper to be printed is laid face down. After each sheet has been printed, it is placed between the top two layers. The middle layer is slightly bigger than the outer two to facilitate easier handling. The maximum dimension, lengthwise or widthwise, is 91cm; the other dimension can be what every you want. We will cut to your size, or mail you one piece rolled up for you to cut by yourself. Two clips come with the pack. 2,000 yen for one nearly square meter (91cm X 100cm). If we cut to your sizes, we will calculate according to this basic cost.